Read about humanaquarium in Wired UK. 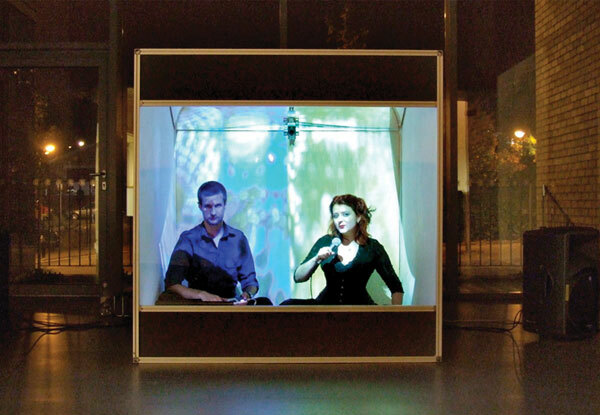 humanaquarium is a movable performance space designed to explore the ephemeral yet tangible relationship between artist and audience in the performing arts traditions. Two musicians collaborate with participants, sharing the intimacy of co-creating an aesthetic audio-visual experience localized within the uncanny confines of the humanaquarium's miniature stage environment. Participants approach the structure and are encouraged to make contact with the humanaquarium's touch sensitive transparent screen. Their touches and gestures influence the sonic and visual properties of the musicians' ongoing performance, allowing the participants to share in the performance development. Fantastical sounds and imagery emanate from within the unprepossessing wooden box which rests simply on the ground. humanaquarium is designed to be placed in places where pedestrians move. People are intended to discover and explore the installation situated in public space. Drawing upon the traditions of improvisation and busking, we bring the audience members into the performance frame, encouraging them to share in the experience of ludic and creative play. humanaquarium was presented over fifty times in performances taking place between 2009 and 2011. Notable exhibitions included Maker Faire UK, the BBC Free Thinking Festival, as well as performances held in the Banff New Media Institute and at CHI 2011 in Vancouver, Canada. and the Alberta Foundation for the Arts.